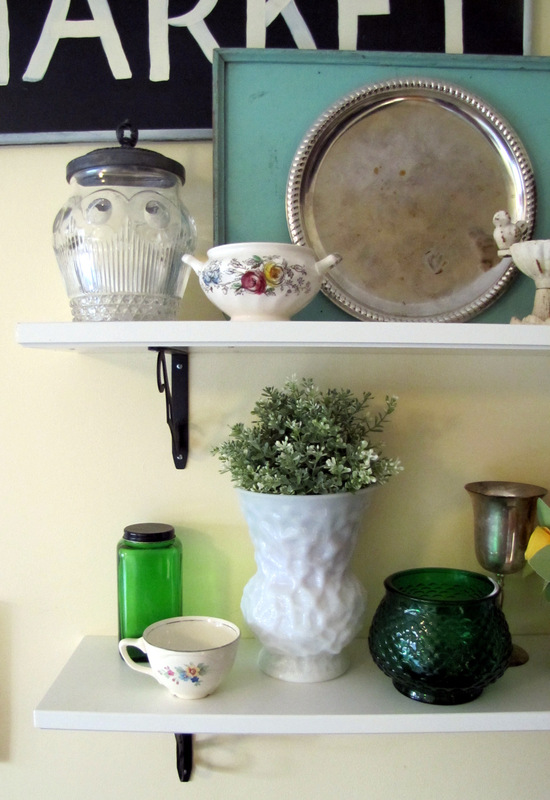 I recently pinned this adorable shelf vignette from Heather’s Pretty Petals blog. 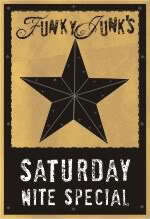 I starred at it and stared at it and stared at it. Boy, I love this display. 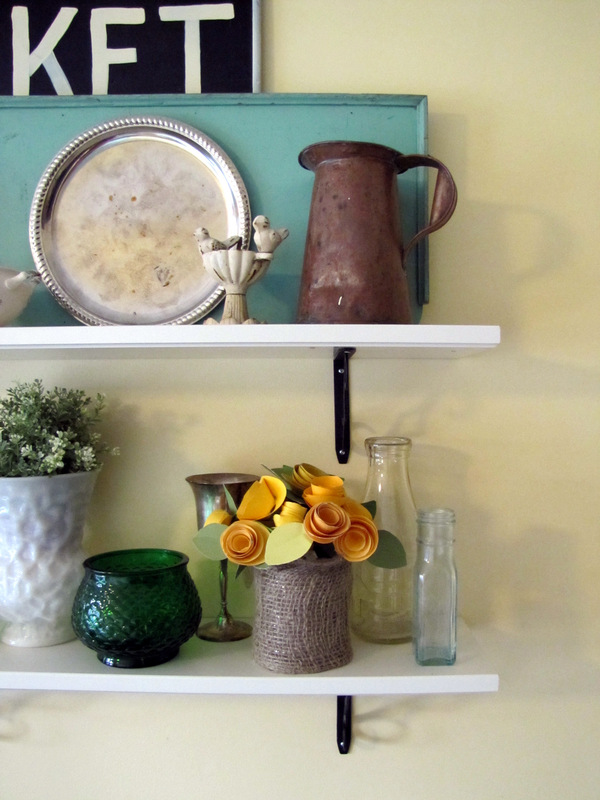 It’s the perfect combination of vintage textures & colors, arranged so perfectly. Wouldn’t you love to have this somewhere in your home? Well, I decided to take on the challenge of re-creating Heather’s with items I have laying around the house and a little from local thrift stores and yard sales. After spending a whopping $7.50, I think I did a pretty good job copy-catting Heather’s style. 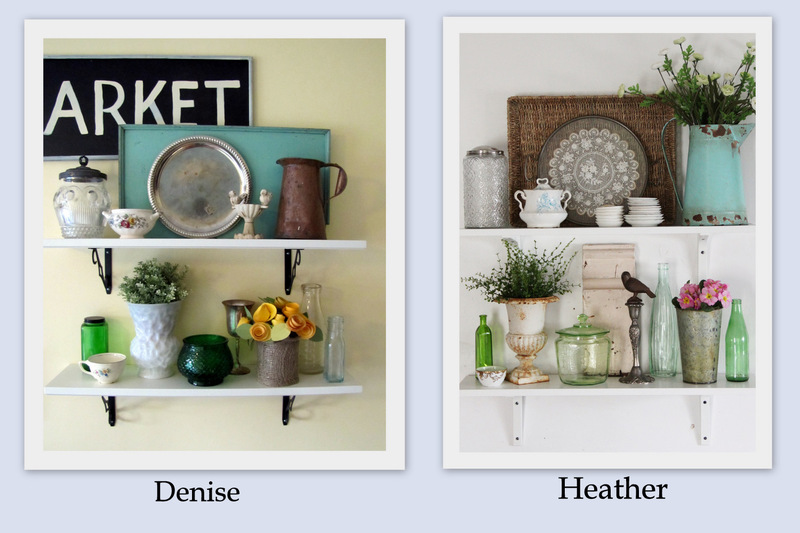 I laid out all my vintage finds and compared them to Heather’s photo of her shelves. all the fixings for a great display. 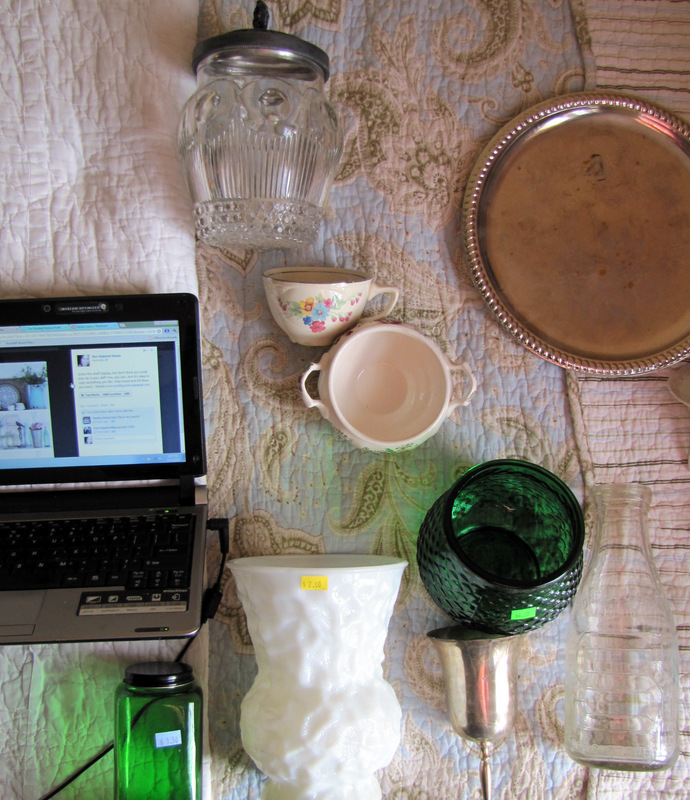 And began adding my items, trying to balance texture & color, and layering. Just like Heather did. Much better then the original collection of crap that was on my shelves. It’s not exactly Heather’s, but has the same feel, which is what I was going for. After all, everybody had their own collection of vintage items. try to incorporate in your home. 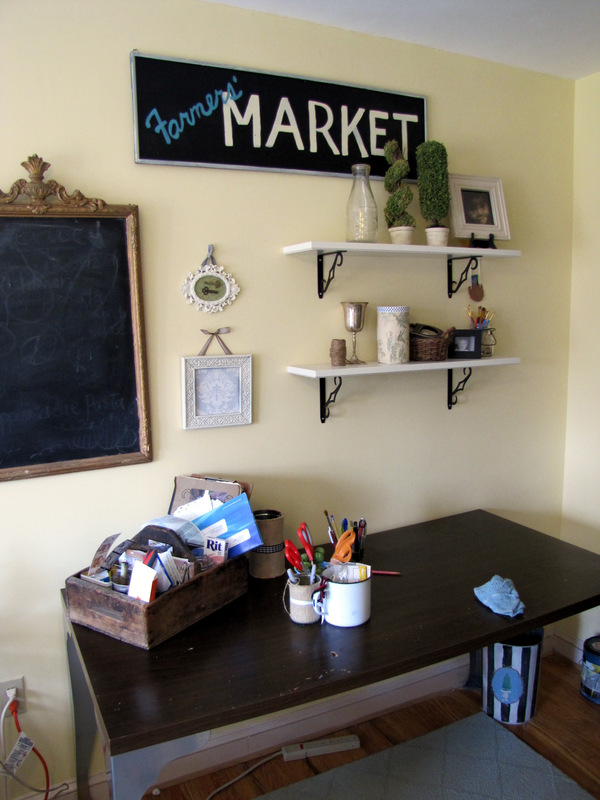 You can learn so much from Pinterest and Home Decor Blogs. Yay! It looks lovely – nice job! 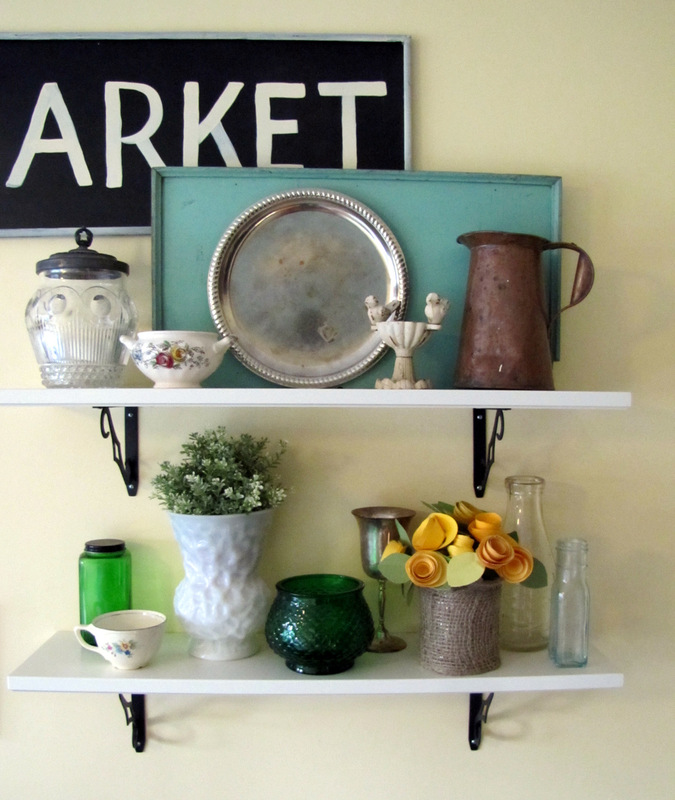 I love what you did with your vignettes on your shelves – a perfect blend of smooth, texture, patina – great work!! Pinterest is great for inspiration. I just did a post yesterday about Pinterest as well. And i can't wait for yard sale season to start! Home design with beautiful pictures it's good idea.Thanks to sharing this beautiful idea with this beautiful pictures. I love your shelves, and you did a great job recreating your inspiration photo. Your pieces have similar shapes to Heather's too. 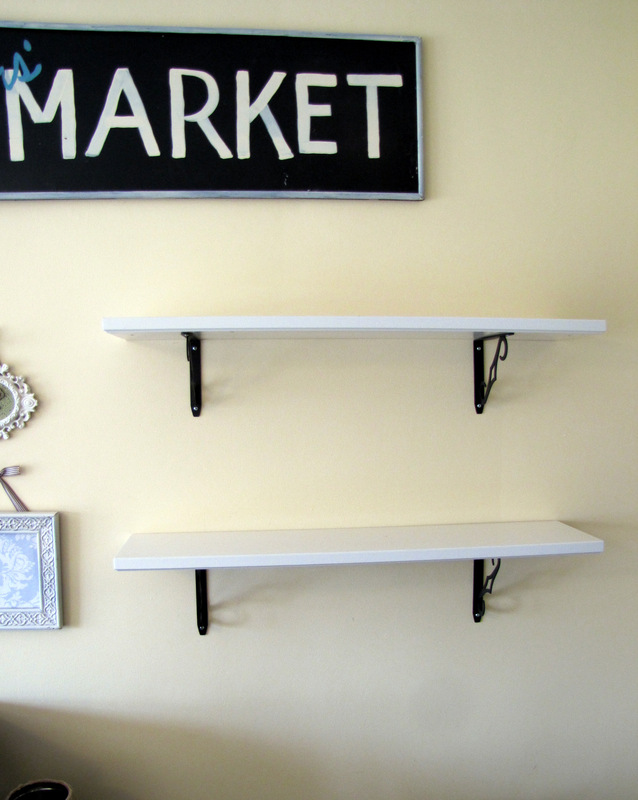 I just posted my refreshed for Spring kitchen shelves but they seem to be lacking the flow of yours. Love your shelves! So cute and very "country pretty"! I have been inspired by so many "Pins"! You allot such great idea for home design. You give fantastic and wonderful images with us. I like this post so much. Love your shelves! Look so pretty!